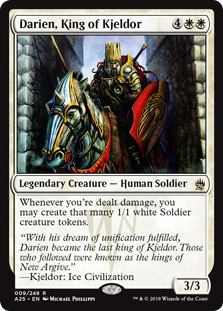 Darien, King of Kjeldor inspired this archetype (and other creatures to gain back life.) Whenever you're dealt damage, you may create that many 1/1 white Soldier creature tokens. So how will this work within the archetype is that each card in the archetype will have an effect to Special Summon token when dealt damage while that card is in the graveyard. taking damage and getting tokens while healing yourself. mass a constant army to keep overwhelming opponents, building sturdy defense and outlast your opponent's brutally. keeping removing cards off the board until your opponent can not deal with your overwhelming numbers. When this card is activated: activate directly from your hand, Deck or GY 1 "Suffering of Kjeldor". All "Kjeldor" monsters you control gain 300 ATK and DEF. (This is a quick effect) you can destroy 1 "Kjeldor" monster you control to gain 300 Life Points then, place 1 Kjeldor Counter on this card. When this card leaves this field; add from your Deck "Kjeldor" cards except "Glorious Kingdom of Kjeldor" with different names from your Deck and/or GY to your hand equal up to the number of "Kjeldor Counters" that was on this card. You can only activate each effect of "Glorious Kingdom of Kjeldor" once per turn. Reveal 1 "Kjeldor" card in your hand and Destroy 1 card you control; banish 1 card your opponent controls then, draw 1 card. During your Main Phase while this card is in the GY except the turn this card was sent to the GY; you can discard 1 card; add this card to your hand. If you take damage while this card is in your GY except the turn this card was sent to the GY: Special Summon 1 "Kjeldor Token" (Warrior/EARTH/Level 1/ATK 100/DEF 2000) in Defense Position. You can only activate each effect of "Flames of Kjeldor" once per turn. Special Summon any number of "Kjeldor" monsters from your hand then, draw 1 card. If you take damage while this card is in your GY except the turn this card was sent to the GY: Special Summon 1 "Kjeldor Token" (Warrior/EARTH/Level 1/ATK 100/DEF 2000) in Defense Position. You can only activate each effect of "Unification of Kjeldor" once per turn. When this card is activated: add 1 "Kjeldor" card except "Suffering of Kjeldor" from your Deck to your hand. You can activate "Unification of Kjeldor" from your GY. (This is a quick-effect) you can destroy 1 "Kjeldor" monster you control; inflict 100 damage to your Life Points then destroy 1 monster your opponent control. During your End Phase you gain 300 Life Points. If you take damage while this card is in your GY except the turn this card was sent to the GY: Special Summon 1 "Kjeldor Token" (Warrior/EARTH/Level 1/ATK 100/DEF 2000) in Defense Position. You can only control 1 face-up "Suffering of Kjeldor". You can only activate each effect of "Suffering of Kjeldor" once per turn. If this card is Summon: add 1 "Kjeldor" card from your Deck to your hand. If a "Kjeldor" monster you control attacks or is attacked before the damage step; all face-up monsters you currently control gains 100 ATK and DEF. If you take damage while this card is in your GY except the turn this card was sent to the GY: Special Summon 1 "Kjeldor Token" (Warrior/EARTH/Level 1/ATK 100/DEF 2000) in Defense Position. You can only activate each effect of "Kjeldor Mob" once per turn. If this card is Summon: Special Summon 1 "Kjeldor" monster from your Deck. If a "Kjeldor" monster you control attacks or is attacked before the damage step; you gain 300 Life Points. If you take damage while this card is in your GY except the turn this card was sent to the GY: Special Summon 1 "Kjeldor Token" (Warrior/EARTH/Level 1/ATK 100/DEF 2000) in Defense Position. You can only activate each effect of "Kjeldor Town Crier" once per turn. If this card is Summon: add 1 "Kjeldor" card from your GY to your hand. If a "Kjeldor" monster you control attacks or is attacked before the damage step; all face-up monsters your opponent currently controls loses 100 ATK and DEF. If you take damage while this card is in your GY except the turn this card was sent to the GY: Special Summon 1 "Kjeldor Token" (Warrior/EARTH/Level 1/ATK 100/DEF 2000) in Defense Position. You can only activate each effect of "Kjeldor Gravedigger" once per turn. If this card is Summon: Special Summon 1 "Kjeldor" monster from your GY. If a "Kjeldor" monster you control attacks or is attacked before the damage step; inflict 300 damage to your Life Points and your opponent's Life Points. If you take damage while this card is in your GY except the turn this card was sent to the GY: Special Summon 1 "Kjeldor Token" (Warrior/EARTH/Level 1/ATK 100/DEF 2000) in Defense Position. You can only activate each effect of "Kjeldor Shaman" once per turn. If this card is Summon: banish 1 card your opponent controls. If a "Kjeldor" monster you control attacks or is attacked before the damage step; send 1 "Kjeldor" monster from your Deck to the GY then, inflict 100 damage to your Life Points. If you take damage while this card is in your GY except the turn this card was sent to the GY: Special Summon 1 "Kjeldor Token" (Warrior/EARTH/Level 1/ATK 100/DEF 2000) in Defense Position. You can only activate each effect of "Kjeldor Mayor" once per turn. If this card is Summon: banish 1 card in your opponent's hand face-down. If a "Kjeldor" monster you control attacks or is attacked before the damage step; This card gains 100 ATK for every card on the field, in both player's hand and all cards in the GY then you gain Life Points equal to this card's ATK. When your opponent activates a card or effect that targets a card(s) that points to this monster (Quick Effect): You can inflict 800 damage to your Life Points and if your do; banish 1 card on the field. If you take damage while this card is in your GY except the turn this card was sent to the GY: Special Summon 1 "Kjeldor Token" (Warrior/EARTH/Level 1/ATK 100/DEF 2000) in Defense Position. You can only activate each effect of "Kjeldor Guru" once per turn.